Sometimes this world can be a cruel place. Sometimes the endless universe can make you feel so insignificant. But three simple words can instantly change your perspective on life. These original return address labels remind you that no matter what happens, no matter how you feel, Jesus loves you. He always will. 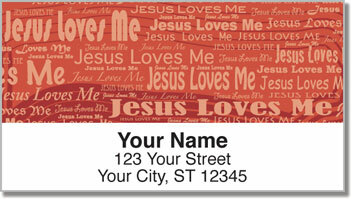 Now you can spread the love of the Lord to everyone on your mailing list. Stick a message of hope and salvation on every envelope. You'll be pleasantly surprised at how easy it is to complete the tedious task of preparing outgoing mail. Just peel and place and send your letters and packages on their way. Get your very own Jesus Loves Me Address Labels today! You can also order matching personal checks.